Salsa Verde Chicken Tater Tot Casserole - ridiculously good! Everyone LOVES this easy Mexican casserole!! Chicken, green chiles, sour cream, chicken broth, cumin, flour and butter. No cream of anything soup! We make this at least once a month! SO good!! 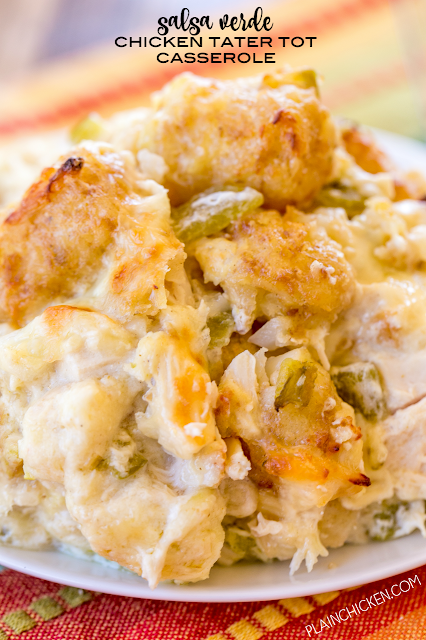 Stop what you are doing and make this Salsa Verde Chicken Tater Tot Casserole!! OMG! Crazy good!!! Chicken and tater tots tossed in a creamy green chile sauce and pepper jack cheese. All of my favorites in one pan! We ate this for lunch and leftover for dinner the same day. The creamy green chile sauce is one of my favorites. It is so easy to make and it doesn't have any Cream of Anything soup. I always use full fat sour cream in the sauce. I haven't tried it with low-fat or fat-free sour cream. If you try either one of those varieties, let me know how it turns out. 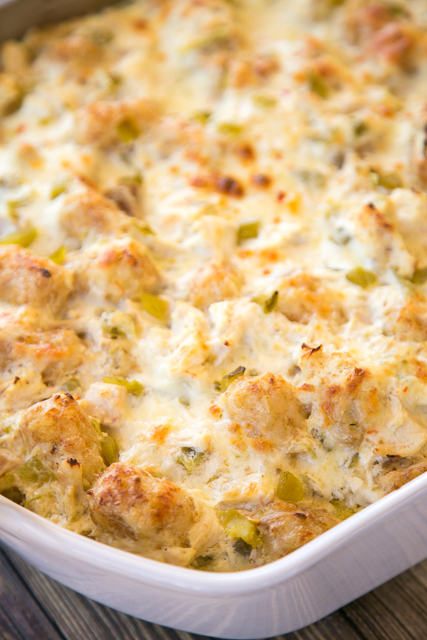 This casserole has a little kick from the green chiles and pepper jack cheese. You can certainly use a different cheese if you are worried about the heat from the pepper jack cheese. Cheddar or Monterey Jack cheese would work great. In a small sauce pan over medium heat, melt butter. Whisk in flour and cook 1 minute. Add broth and whisk until smooth. Allow sauce to thicken. Remove from heat and stir in sour cream, chiles and cumin. In a large bowl, combine chicken, tater tots, cheese and sauce. Stir until thoroughly combined. Pour into prepared pan. Would this work as a freezer meal? Make up and freeze before cooking? Made this friday night, added a can of white corn. So delicious! OMG! Had this tonight and this was so GOOD!!!! Lick the pan good! I love that it doesn't rely on cream of anything soup too! This is definitely a keeper in our house! I got lazy and didn't do the whole melted butter/flour in a pan thing. I just mixed all the ingredients in the baking dish and threw it in the oven. It was so, so good! Thank you for the recipe! Any suggestions for a side dish? Does it need one? We usually eat some Southwestern Black Beans with it - http://www.plainchicken.com/2017/01/southwestern-black-beans.html. You could also make a quick salad with some guacamole on top. Do you think you could sub Greek yogurt in for the sour cream. Can't wait to try this hotdish! I haven't tried this with Greek yogurt, but I don't see why it wouldn't work. Enjoy!